Always at Least 10 lbs - Year Round! One of the questions we get from chefs out there is "how big are the fish?" Apparently they are used to getting fish from some places that are small part of the year. Ours aren't (small that is). Because we have 21 farms (7 which are always in fallow to allow the seabed to rest after harvest), we can always ensure a new generation of fish is ready to be harvested at just the right size: minimum 10 lbs and sometimes as large as 18 lbs. That's 365 days of the year by the way. That means great yields, consistency and ability to plan your menu. Chefs - if you value these things in addition to everything else Skuna Bay promises (and delivers on), call our exclusive distributor partners and get our fish. 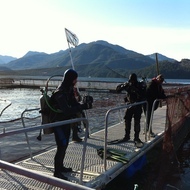 The mission: feed the world, help reduce pressure on wild salmon stocks. It can be done better. It can be done responsibly. It can be done producing the best quality salmon possible so that chefs can give their customers a great salmon dining experience year round. How? By patiently and painstakingly raising salmon for 3 1/2 years until that beautiful, silver, muscular specimen is ready to be pulled from its natural ocean waters and sent quickly to the restaurant. Our farmers believe that the best salmon come from the ocean - pristine, glacier fed, strong tidal currents of the Pacific Ocean. Our farmers believe you can't raise a good fish packed densely into a tank on land. Our farmers believe you can do things slowly, differently, responsibly and ultimately that will be better. And that is their commitment to you Mr and Ms Chef. There have been a lot of stories in the media recently about how good it is that some businesses are trying to raise salmon in massive tanks on land. We think this is exactly the opposite of where salmon should be raised. Salmon is from the ocean and should stay in the ocean. We have access to the best, most pristine, natural ocean waters in the world and raising salmon in those waters is good for the fish, helps the environment and most importantly results in great quality fish. 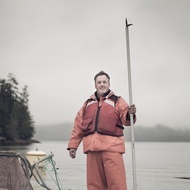 At Skuna Bay our craftsmen farmers are proud to put their salmon into our ocean farms off the coast of Vancouver Island, farms which have low densities (our farms contain 98.5% water and only 1.5% fish) in pristine, natural, ocean waters. Not only is that the right thing to do for the fish but it results in great quality and it is good for the environment. That's Skuna Bay's commitment to you, the chef. First and foremost, this is about feeding people. But not just feeding people - giving chefs the quality fish they need in order to give their customers a great salmon dining experience. But it's not just about that either. It's about helping to reduce pressure on wild fish stocks while we do this. It is about careful, craft-raised standards, it is about finding the best natural ocean water for our salmon. It is about giving the craftsman farmer the respect he deserves for standing out there in the teeth of mother nature watching his fish grow to the right size over the 3 year period it takes to raise them. To do that it is about developing a way to ensure that that beautiful salmon the farmer pulls out of the water is delivered to the chef in the same condition: fresh-from-the-ocean. It is about traceability. It is about finding a box that can be recycled.